I’ve been wanting to speak to my guest, John Jantsch, for a long time. This is because I’ve been working with small businesses for most of my career. And small business marketing is John’s sweet spot. We start the conversation talking about the new hipster haven—Kansas City, MO. Yep, you heard me right. So of course, we get to talking about John’s home town of KC, what’s great about the city, and other creative havens popping up around the U.S.
Then we get into John Jantsch’s own story. How he found his way into the marketing world and marketing strategy for small business. We quickly learn that John was and is unemployable—he started setting his own course 28 years ago, mainly working with small businesses. Around 2000 he realized he needed to create a systematic approach to small business marketing done right. And this “system approach” is what really led to the Duct Tape brand. Most small businesses struggle with marketing. They need a simple, effective, and affordable approach like Duct Tape Marketing. So we discuss the genesis of his business and how it has evolved over the years. Then we dive into building a personal brand as an ultimate source of power. For me, any branding exercise is about taking ideas (sometimes a mishmash of stuff) and distilling those ideas down to something that effectively communicates to the right people. So, we take a deep dive into John’s process of building the kind of brand authority that can attract new business and create more opportunities by speaking to the right people. John says effectively building a rock-solid personal brand all starts with a point of view. We also talk about the importance of the initial brand steps. This is usually called positioning—boiling a company’s essence down to a paragraph, maybe even a sentence, or dare I say, one word. We talk about this and John’s one word—practical. So we discuss the practical approach of the Duct Tape Marketing system and how John has expanded on this word in his own branding. More on personal branding done right and making it online. Then we expand our branding discussion and talk through developing a point of view. How do you become that go-to person with a magnetic personal brand? For someone entering the crowded online realm now, how in the world do they become the go-to expert? Rise above the noise? By developing a specific point of view, sticking to it, and truly adding value to someone’s life. Turn it into THE way. YOUR way. John has a framework called The Marketing Hourglass. The concept is really about spending time with the customer after they become a client. We get into the seven stages and why it’s important to start with and end in mind by asking yourself the following: How do I want my customers to feel 180 days after a purchase? Always think about the customer experience fist, because a happy customer is your best referral source. This focus on customer loyalty is crucial to your success. Then we transition to our online bubble, discussing rising stars like John Lee Dumas and Derek Halpern. Which leads to a discussion about the comparison game, John’s admiration for John and Derek, and also mention of those who shall not be named, who are not so honest. When it comes to selling the idea of making money online, there are many doing it right (like John and Derek) but many who are not. So, we naturally talk about the not-so-easy path. The not-so-secret “secret” to John’s success. Truth. Then we get into the art of delegation and how to scale your business. A true entrepreneur asks the following: How can I get someone else to do this? And that is something you must do if you want to grow your business—start offloading everything you can as soon as you can. So, how do you start? Put together a “not-do” list. John says the key is starting by identifying the high-paying activities. John always takes two full days a week to focus on his business. On these days he doesn’t do anything else. For you, this is when you take inventory, think, strategize. Look at your big goals and work to develop a structure for the things you must do to get there. Then start doing them. 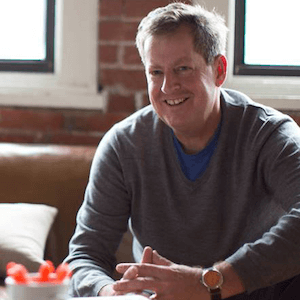 We end by talking about the entrepreneurial struggle and habits that keep John on track. Exercise is a big part of his day, as is meditation and writing. John has very structured days. So we talk about all his “best practices” when it comes to keeping up a healthy, productive, and highly-structured routine. I also ask for his opinion on the live streaming craze (Periscope anyone) and where it’s going. A good takeaway from this discussion: When John is advising clients he usually tells them to not look at the next big thing. He asks them the following: Is there a way to enhance your customer experience with these tools? If not, drop it. If so, let’s see how. I love that advice and I think you’ll love this conversation. When did Duct Tape Marketing start? What are the first steps to effectively build a magnetic personal brand? In your own brand positioning you use the word “practical.” How have you expanded on this word? For someone entering the online realm now, are their specific practices that will help them rise above the noise? What is your Marketing Hourglass framework? What are habits that keep you on track? What about reinvention and those 40, 50, 60 year olds who want to break out online. People who haven’t been in the game and are wanting to jump in. Where do they start? All about John’s Duct Tape system and consulting network. Great advice on how to scale your business. John takes 2 full days a week to focus on his business and doesn’t do anything else. The importance of IDing your priorities and the areas you need to grow. Great advice on how to build a personal brand. The Timeless Way of Building by Christopher Alexander. John says this is one of his most influencial books. Hey Craig – this was a fun interview and I appreciate your thoughtful approach. Thank you for being on the show and providing TONS of value! wow thanks for sharing .it’s really good ,i need this advice….